Seventeen people have been killed by police in the week since the Obama Justice Department announced that it would not bring federal charges against Darren Wilson, the Ferguson, Missouri cop who killed unarmed teenager Michael Brown in August. On Monday afternoon, a Georgia police officer shot and killed 27-year-old Anthony Hill at the apartment complex where he lived in Chamblee, a suburb of Atlanta. Hill was naked and unarmed at the time, and was apparently suffering from mental illness. That shooting followed the killing of Naeschylus Vinzant, 37, another unarmed African American man, on Friday in Aurora, Colorado, a suburb of Denver. On Monday, police said that Vinzant was shot dead by a heavily-armed SWAT team called out to serve him with an arrest warrant. None of those involved in the arrest were hurt. Since the beginning of the year, more than 204 people have been killed by police, following the more than one thousand police killings last year, according to killedbypolice.net. This includes the shooting of unarmed 19 year-old Anthony Robinson in Madison, Wisconsin on Friday. The killing of Hill produced outrage among neighbors in Georgia. Hill was an Air Force veteran who was friendly with local children and an aspiring musician. Pedro Castillo, a forty-three-year-old maintenance worker at Anthony Hill’s apartment complex, told the New York Times that Hill had his hands up at the time he was killed. All eyewitnesses report that there was no struggle between Hill and the police officer before the latter shot to kill. Police officials claimed that Hill charged at the officer who then opened fire, hitting him twice in the torso. Hill, who died at the scene, was African American while the as yet unidentified officer, a seven-year veteran, is white. The officer has been placed on administrative leave until the Georgia Bureau of Investigation makes a determination of whether the shooting was justified. The police chief confirmed that the officer had been armed with less lethal equipment that could have been used to subdue Hill. “Yes, he was equipped with all the appropriately issued police equipment, including taser,” he said, adding that the officer was also armed with pepper spray. The ongoing wave of police killings takes place as protests against police violence in Madison, Wisconsin continue following Friday’s killing of Robinson. Police shot Robinson after charging into his apartment. On Monday, thousands of high school and college students walked out of class and converged on the state capitol and city hall to protest the killing. Up to two hundred people participated in a demonstration Wednesday at the Madison city county building, and up to several thousand are expected at a demonstration today. On Tuesday, Buzzfeed News reported that Anthony and Javier Limon, Robinson’s friends who lived in the same apartment, were questioned for up to five hours by police without attorneys present. Video posted online showed attorneys and family members for the two boys attempting to speak to them, and being prevented from doing so by police officers. 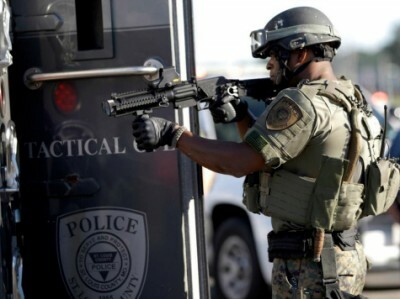 The ongoing nationwide epidemic of police murder and abuse gives the lie to the claims by the Obama administration that conditions documented in the Justice Department’s report on Ferguson, Missouri are not “endemic” throughout the United States. The report showed that Ferguson police showed a “pattern” of illegally detaining and beating residents. In reality, a police badge is effectively a license to kill in the US. In working-class communities throughout the country, the police effectively function as judge, jury, and executioner, brutalizing, arresting and killing workers and young people with impunity. The growth of police violence, which according to government statistics has hit the highest levels in decades, parallels the dramatic expansion of social inequality in the US. The de facto legal immunity granted to killer cops is similar to the effective immunity from prosecution granted to the Wall Street bankers who helped trigger the financial crisis, and to CIA torturers. The daily murder and violence meted out against workers and young people every day takes place with the sanction of the Obama administration, which has done everything in its power to shield killer cops from prosecution, ensuring that the police are allowed to continue their reign of violence and terror. The Obama administration’s decision not to bring federal charges against Wilson was effectively a green light for police murder.